Home >How to Build a Magento Site to Sell Wholesale Clothes? 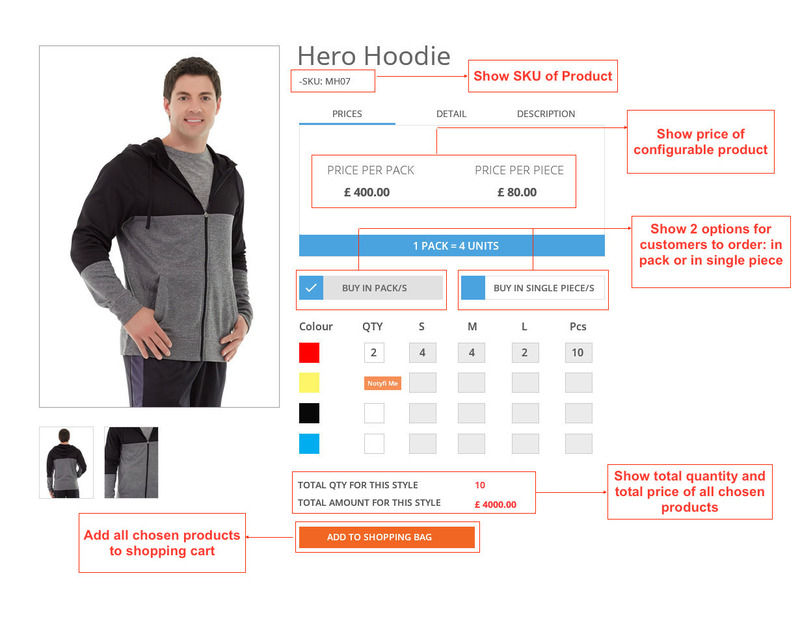 How to Build a Magento Site to Sell Wholesale Clothes? 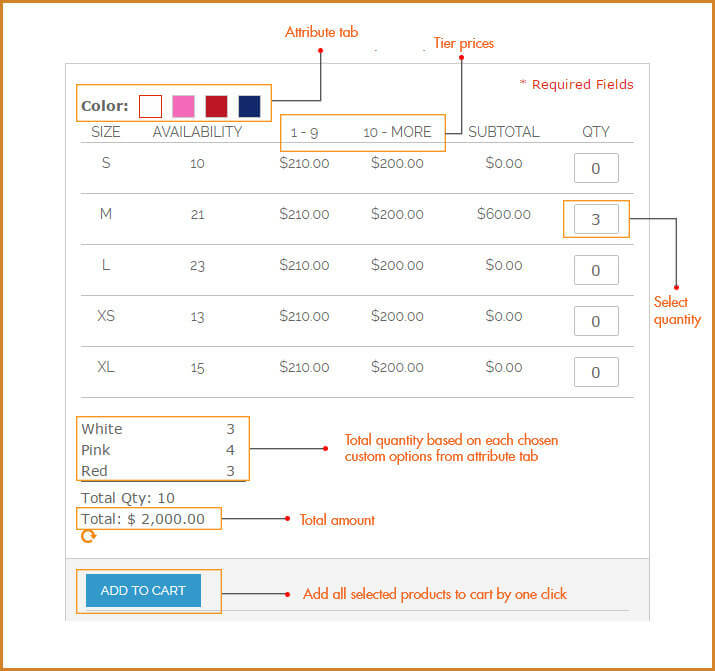 Have you ever considered using configurable products to sell clothes for merchants and B2B business? 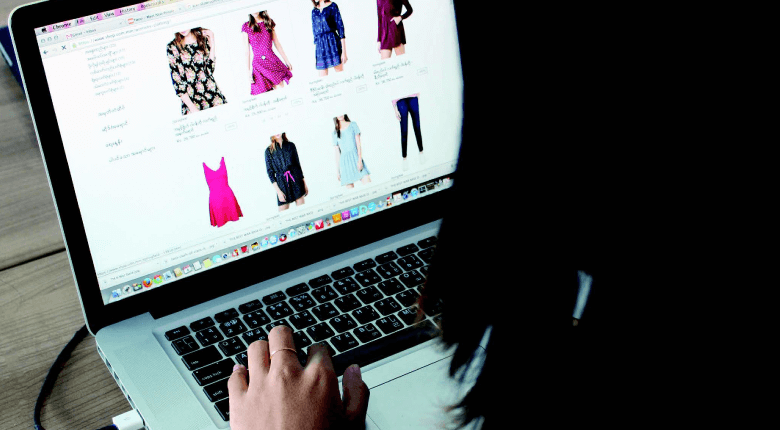 When building a clothing website based on Magento platform, a lot of site owners have difficulties in setting up products, such as: which type of product should be used, how to sell items to specific customer groups or how to sell more details on a product page. Those are significant issues for online store owners. Therefore, we highly recommend using configurable products to set up products for your site to sell wholesale clothes. At first, configurable products have choosing or drop-down display for customers to choose options of attributes. This feature of configurable products allows showing all attributes of product so that customers can easily choose custom options of the attribute to combine into a simple product and add to cart. + Customers can just add each child product to cart each time. 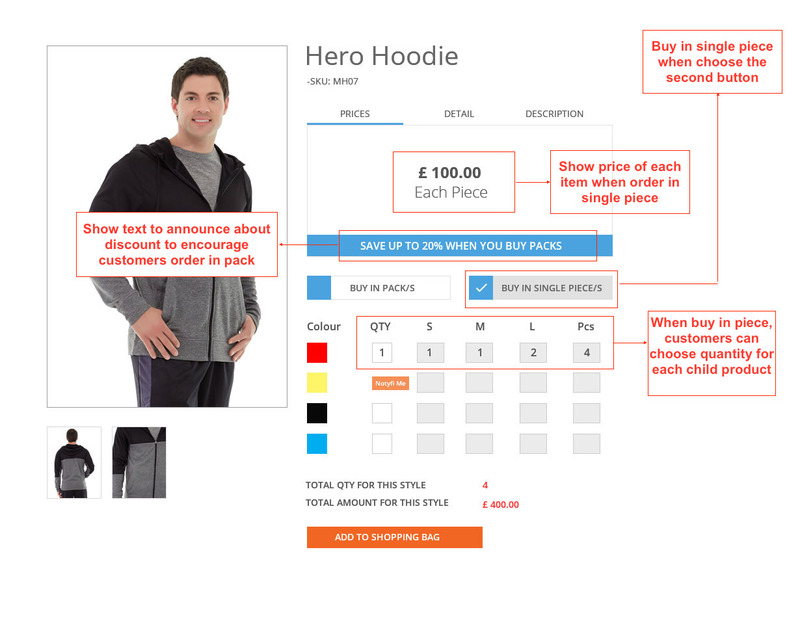 + Customers cannot see the total price when ordering a lot of items unless they click into the shopping cart. If you are interested, check this blogpost for more details about configurable products. When building websites for several clients, we receive requests to customize configurable product functionalities and display to allow setting all kind of colors/materials/size of clothes on the same page without having to navigate to so many webpages as well as ability to sell in pack and ability to limit access of specific customer groups. On this blog, we focus on one ability to sell in the pack and reveal 2 solutions for this. We create a module that allows displaying attributes of configurable products in a more simple table to help customers add multiple simple products to cart at once. This solution is greatly useful for wholesale business because it let customers choose many items at once without taking much time to buy one by one as before. Customers can add as many as items they want to cart and do not have to repeat this process for times. This brings a larger amount of revenue as well as enhance wholesale business to develop. Therefore, it is one of the most important features that Magento stores can satisfy wholesale customers is providing a quicker ordering or in the other hand, they can purchase in bulk by filling wanted quantities for each children product. This module is named Configurable Product Table Ordering extension. If you want to find more available modules for configurable products, check this blog. Regarding this solution, we suggest customizing new extension, which helps wholesale customers to purchase in pack or piece as wish. It will limit access to purchase for different customer groups by requiring customers to login; they can see SKU, price, details, and description of a configurable product. Especially, there will be 2 options to order, which is suitable for merchants and B2B businesses. 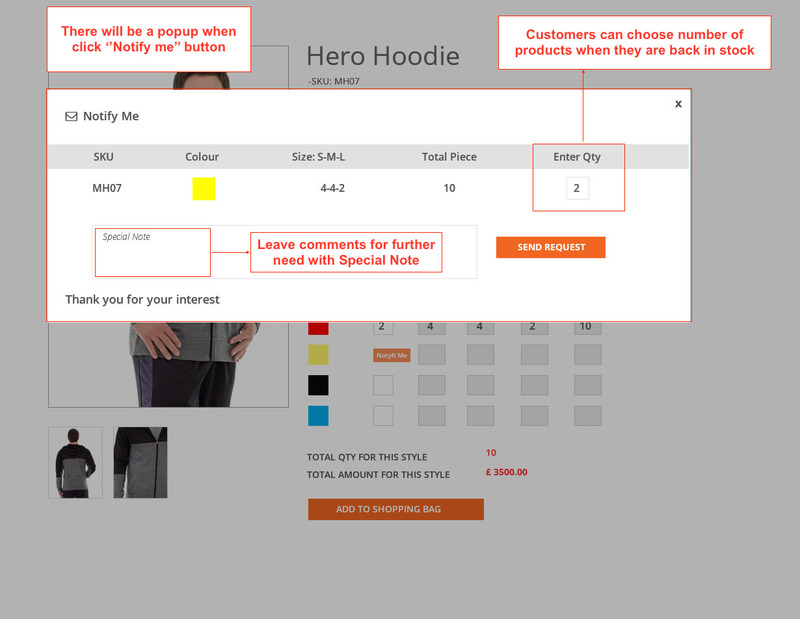 + If one of the attributes of a simple product is out of stock, show a button for customers to get notifications when it’s back in stock: a popup will be shown up, customers can choose the quantity and leave comments and then send the request. + Customers enable to choose the quantity for each child product. Why should you select the second way? First of all, it is suitable for B2B businesses because of its useful display and features. It allows wholesalers to order both in the pack and unique pieces. Moreover, due to the login requirement, retailers or not-logged-in customers cannot order in the pack that helps to save items for only wholesalers. Secondly, this way will stimulate merchants to buy in a pack with a large number. All customers need to do is set quantity due to the list ratio is fixed. Hence, this solution will help customers to order conveniently and economically when they purchase items in packs. Last but not least, this second solution not only optimizes the display of configurable products but also boost particular product’s sales as wish. 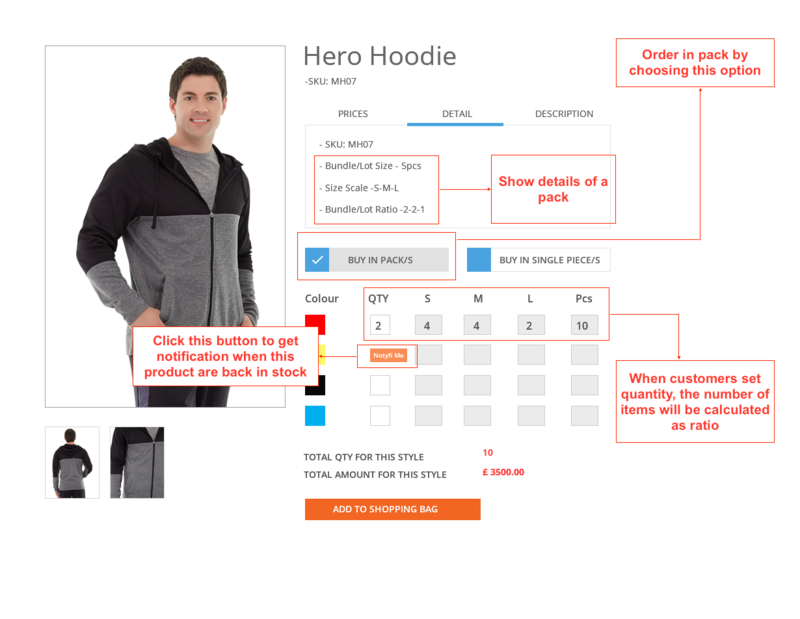 If store owners want sales of a t-shirt with M size, they just set up S-M-L with ratio 1-2-1 respectively, for instance, in the backend, the M size one will be boosted. In conclusion, you can choose which option as you want to depend on your site and your demand. Besides, if you prefer the second way, let’s contact us to make it real. You can also find many useful pieces here around. Hence, feel free to explore our blog.